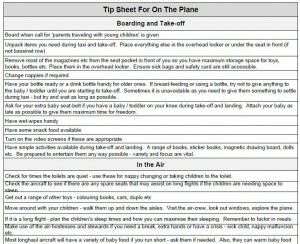 Tip Sheet to assist you when traveling on the airplane with your baby or toddler. This Tip Sheet is downloadable in a pdf file or excel spreadsheet – fitting on one page so it is an easy reference tool while flying. The aim of the Tip Sheet is to enable you to remain one step ahead, maximising your chances of a successful experience when flying with your young ones. There is often so much to think about and do – it is easy to forget something important – this Tip Sheet will assist you in not forgetting to get that little but very important task completed. Feel free to download the files and customise them for your own use. You can then print them and take them with you in your travel wallet. Enjoy. Please download the files here. You can also gain a lot more detailed information at the On The Plane page here. We trust you found this Post and Tips Sheet useful. Please feel free to leave your feedback, comments and questions below and I will be sure to get back to you.